I bought a video camera to take on our summer vacation. It was a simple camera, with a modest zoom lens and absolutely no extra gadgets: a stripped down version, the cheapest I could find on the market. With it, I bought an adapter that would let me plug the thing into the car’s cigarette lighter. We shot several hours worth of tape as we drove up the Rocky Mountains and back. And the single greatest boon the purchase returned on its investment was totally unexpected. It was not the “moving snapshot” aspect that turned out the most important. Sure there are lots of shots of scenery, and of my wife standing in front of Yellowstone Falls. And a few times when Carole took the picture of me instead, and decided she wanted a vertical frame, so turned the camera sideways. Or some pictures when we forgot to turn the camera off. No, the most important thing to find out is that a video camera captures the wind. It is there in almost every shot: the hiss and blow of air moving across the internal microphone of the videocam. The sound of the breeze made us notice the moving seedheads of the grass, the dancing aspen leaves, the rising of the ends of Carole’s hair as she stood in front of the falls. Without the intervention of “art,” the wind becomes part of the unnoticed background noise we filter out in our daily lives as we pay more attention to such important things as the mowing of grass or the seventh inning of the Braves’ game. Unless there is a full blow tearing through town, and shingles switch roofs from one house to the neighbor’s, we don’t much pay attention to the moving air. But out in the countryside, and seen through the eye of the video lens, the air is never still, and within the air, nothing that can move doesn’t. The entire world is constantly in motion, wiggling and twitching. My wife, who has studied such things, tells me that certain Plains Indian tribes understood the wind to be evidence of the Great Spirit, “Taku-scan-scan” in Lakota. Anything that moves in nature is evidence of the Great Spirit: wind, water, breath, the frosty snort of a buffalo in winter. “For them, the world is animated by the spirit, and the wind is the sign of the spirit,” she tells me. That is the purpose of the “peace pipe,” which sends a curl of smoke up into the air so that we may see the motion of the spirit around us through the play of the smoke. The ritual smoke was meant to cleanse the mind and make it receptive, to calm the human heart in recognition of the sacred. I have often felt something of the same when smoking a cigar. I would never use the Native American vocabulary to express it — I am too much the European-American — but most cigar-smokers, I think, will tell you something of the same: There is something relaxing and reassuring in the play of smoke as you blow it into the air and watch it ascend and disperse. Even on a still day, the cigar smoke will twist this way or that, giving away micromovements in the air. If the breath is life, the smoke lets it be seen. And so does the video camera, as it captures the lupine bouncing in the field, the bottoms of the white poplar leaves turning upward, the current running through the grasses, the sideways tilt of the mockingbird’s tail as it takes off in a crosswind. You can see something of this each weekend on CBS, as they end their Sunday Morning with a five-minute bit of video tape taken somewhere in America’s nature. “We leave you this morning,” says Charles Osgood, “in Martha’s Vineyard,” or “in the hills of the Dakotas,” and then we watch as the camera shows us a flock of Canada geese or the hive of some buzzing bees. And always, each week, there is the gentle blow of wind in the microphone, reminding us that all of nature is animated. This recognition is the purpose of all travel, at least for me. When I come to the point of unnoticed boredom with everyday life, to the point that things have lost their edge and become so familiar I no longer see them, there are two things that remind me just how awake the rest of the world can be. The first is art, whose job it is to elbow me awake and make me notice what I hadn’t paid attention to before. And the second is travel, which, by putting me in contact with things unfamiliar, acts as a kind of mirror for my ordinary daily life, showing its face and alert eyes. The vacation videotape combines the two: In every frame, it seems, something is moving, twitching, turning, blown, agile, bouncing. My wife tells me about when her dying father was mostly blind from a stroke. He called to her from the back steps one day, where he sat looking out toward the river and woods. “Catbird, come here and let me show you something,” he said. He couldn’t see the leaves, or even individual trees, only the whole mass of forest moving, dancing, swaying. And he had a terrific grin on his face. Richard, I love this post. Written from the heart, and including personal experience, emotional involvement and wisdom, the piece came alive and reflected better than some days, what a wonderful writer you are! 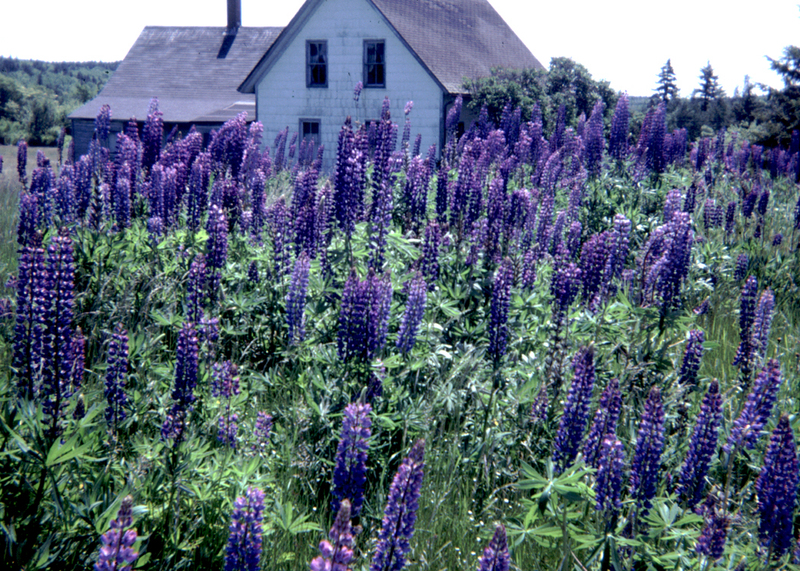 Thank you as well, for the lupines….my favorite.